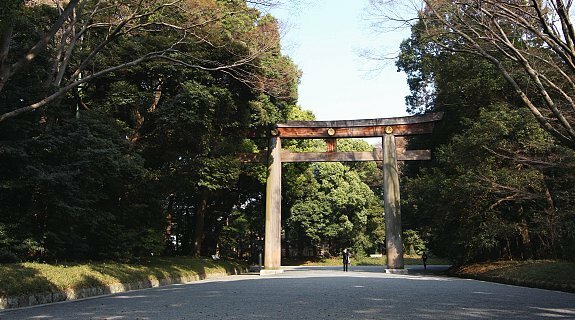 A torii gate along the forested approach to Meiji Shrine Meiji Shrine (明治神宮, Meiji Jingū) is a shrine dedicated to the deified spirits of Emperor Meiji and his consort, Empress Shoken. Located just beside the JR Yamanote Line's busy Harajuku Station, Meiji Shrine and the adjacent Yoyogi Park make up a large forested area within the densely built-up city. The spacious shrine grounds offer walking paths that are great for a relaxing stroll. Emperor Meiji was the first emperor of modern Japan. He was born in 1852 and ascended to the throne in 1867 at the peak of the Meiji Restoration when Japan's feudal era came to an end and the emperor was restored to power. During the Meiji Period, Japan modernized and westernized herself to join the world's major powers by the time Emperor Meiji passed away in 1912. The offering hall of Meiji Jingu The main complex of shrine buildings is located a ten minute walk from both the southern entrance near Harajuku Station and the northern entrance near Yoyogi Station. Entry into the shrine grounds is marked by a massive torii gate, after which the sights and sounds of the busy city are replaced by a tranquil forest. The approximately 100,000 trees that make up Meiji Jingu's forest were planted during the shrine's construction and were donated from regions across the entire country. At the middle of the forest, Meiji Jingu's buildings also have an air of tranquility distinct from the surrounding city. Visitors to the shrine can take part in typical Shinto activities, such as making offerings at the main hall, buying charms and amulets or writing out one's wish on an ema. 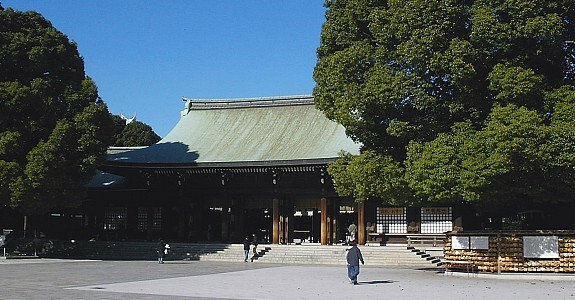 Meiji Jingu is one of the Japan's most popular shrines. In the first days of the New Year, the shrine regularly welcomes more than three million visitors for the year's first prayers (hatsumode), more than any other shrine or temple in the country. During the rest of the year, traditional Shinto weddings can often be seen taking place there. At the northern end of the shrine grounds visitors will come across the Meiji Jingu Treasure House, which was constructed one year after the shrine was opened. 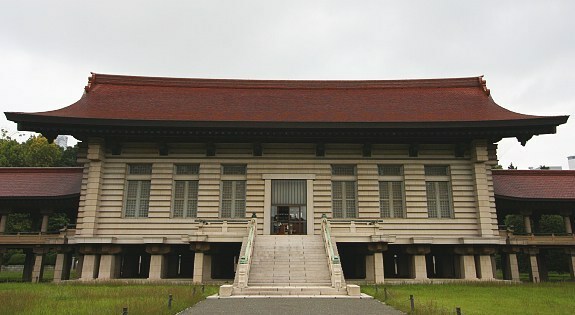 The Treasure House displays many interesting personal belongings of the Emperor and Empress, including the carriage which the emperor rode to the formal declaration of the Meiji Constitution in 1889. There is also a Museum Annex Building just to the east of the main shrine buildings that displays temporary exhibitions. A large area of the southern section of the shrine grounds is taken up by the Inner Garden, which requires an entrance fee to enter. The garden becomes particularly popular during the middle of June when the irises are in bloom. A small well located within the garden, Kiyomasa's Well, is named after a military commander who dug it around 400 years ago. The well was visited by the Emperor and Empress while they were alive and has become a popular spiritual "power spot". The Meiji Jingu Treasure House Interesting place to visit... but I prefer my Tokyo Disneyland!!!!!!!! I wanna go to Tokyo Disneyland!!!!! !